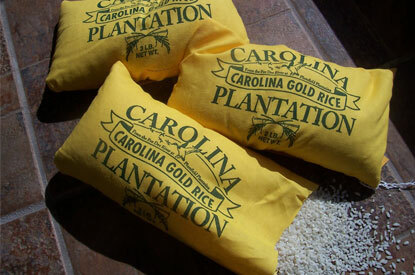 CAROLINA PLANTATION RICE is proud to offer certified South Carolina-grown “Carolina Gold” rice. “Carolina Gold” is only truly authentic when it is grown in the Carolinas. HISTORY OF THE GOLDEN GRAIN: In 1685, a distressed merchant ship paid for repairs in Charleston with a small quantity of rice seed from Madagascar. Dr. Henry Woodward planted the seed in South Carolina, beginning the state’s 200 year history as the leading rice producer in the United States. At the turn of the century, rice cultivation ended in the Low Country South because of a weak market, inadequate machinery, and competition from the Gulf States. THE COMPETITION CONTINUES ... Until recently, most of the “Carolina Gold” on the market, unfortunately has been grown in the Gulf States, not in South Carolina. Because of our commitment to providing authentic Carolina-grown products, Carolina Plantation Rice has devoted a portion of its rice acreage to the cultivation of true “Carolina Gold” Rice. Your purchase of this home-grown product keeps South Carolina growing. Thank You! We are committed to product excellence and will continue to honor South Carolina’s history by bringing you this natural, Carolina Gold Rice for years to come.